But how does one do this with an enum? And then just have an association between that and your class. If your UML modeling tool has support for specifying an Enumeration, you should use that. It will likely be easier to do and it will give your model stronger semantics. Visually the result will be very similar to a Class with an <<enumeration>> Stereotype, but in the UML metamodel, an Enumeration is actually a separate (meta)type. Once it is defined, you can use it as the type of an Attribute just like you would a Datatype or the name one of your own Classes. If you're using ArgoEclipse or ArgoUML, there's a pulldown menu on the toolbar which selects among Datatype, Enumeration, Signal, etc that will allow you to create your own Enumerations. The compartment that normally contains Attributes can then be populated with EnumerationLiterals for the values of your enumeration. Not the answer you're looking for? 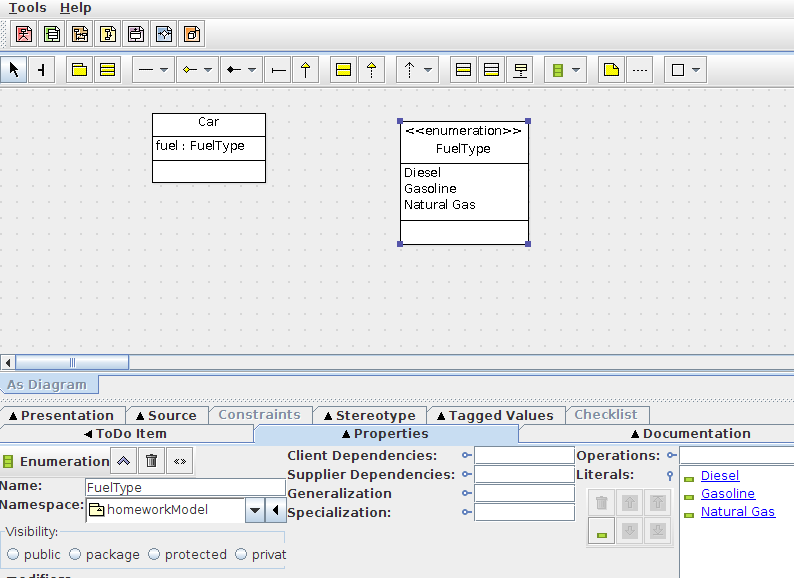 Browse other questions tagged class enums uml diagram or ask your own question. is it recommended to make associations to enum classes in uml class diagram?